ILOILO CITY — A group of survivors of Supertyphoon “Yolanda” (international name: Haiyan) and its supporters asked Social Welfare Secretary Judy Taguiwalo to audit funds meant for building or repairing houses of victims of the 300 kph storm in November 2013 after hundreds of them failed to receive funds from the Aquino administration. A group of Yolanda survivors, Kusog sang Pumuluyo and its supporters on Panay Island, also pleaded to Taguiwalo to finish the distribution of funds for the ESA (Emergency Shelter Assistance) program started by the previous administration but which critics said had left out hundreds of victims. Taguiwalo should also order an audit of funds donated for Yolanda victims following reports that billions of pesos from foreign donors were left unspent by the Aquino administration, Kusog said. Fr. Marco Sulayao, Kusog spokesperson said that “We hope that Secretary Taguiwalo will look into the appeal of the survivors who have been complaining since the previous administration,”. In a text message, Taguiwalo said she would “immediately act” on Kusog’s appeal. In a text message, Taguiwalo said that “We continue to gather feedback from people’s organizations, especially Yolanda survivors, regarding the aid they insist they did not receive,”. She also said that a review of the implementation of disaster relief programs for Yolanda victims “remains one of the priorities” of her department. “We want to make sure that the problems the DSWD encountered in the delivery of aid to Yolanda survivors will not happen again,” said Taguiwalo. “This is precisely why there is a review,” she said. 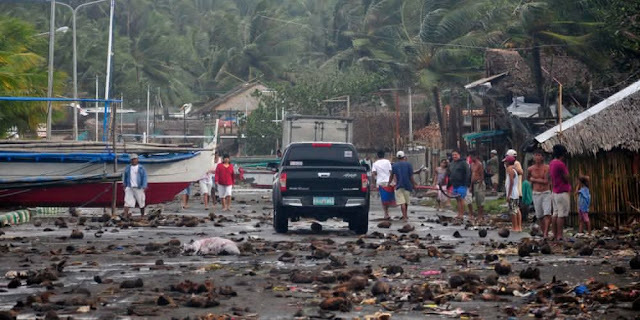 Western Visayas suffered heavily when Yolanda battered the region, leaving behind hundreds of people dead and billions of pesos in property damaged. The region includes the provinces of Aklan, Antique, Capiz, Guimaras and Iloilo. At least 23,814 families (21,114 in Aklan and 2,700 in Capiz provinces) are still waiting for the release of funds for the ESA, according to Sulayao. Most had not been listed as beneficiaries or were excluded from ESA as a result of Memorandum Circular No. 24 issued by former Social Welfare Secretary Corazon “Dinky” Soliman. The memorandum stated that the survivors whose houses were destroyed or damaged are ineligible to receive cash aid if their families have monthly incomes of more than P15,000 and if they are living in areas tagged as danger zones. Survivors who have gotten help from nongovernment sources are also disqualified from ESA, which provides cash grants of PhP30,000 per family that lost its house to Yolanda and PhP10,000 per family that needed to repair its damaged house. Kusog called for the scrapping of the memorandum, calling it discriminatory. The group said disqualifying families with incomes of at least PhP15,000 per month from the program and those that got help from private sources still needed government help because of the massive devastation left by Yolanda. The investigation and prosecution of officials involved in irregularities in the distribution of ESA funds should be continued, Fr. Sulayao said. Deputy Ombudsman Paul Elmer Clemente had ordered the suspension of two village officials in Lemery town for nine months for soliciting PhP10,000 from the ESA funds received by a Yolanda survivor. Barangay Captain Cherryl Peniero and Barangay Councilor Rolly Castro, of Barangay Poblacion Southeast Zone, are also facing a criminal case. The Ombudsman found them guilty of getting P10,000 from Milagros Binas, who was supposed to receive P30,000 in ESA funds since her house was destroyed by Yolanda. Binas said P10,000 of her funds went to the two officials who asked for a “donation” in exchange for their efforts to list down Binas as a beneficiary.